Currently resides and works in Miami, Fl. An accomplished and versatile visual Cuban- American artist, unknown to many, Pastor Castillo was born in Pinar del Rio, Cuba. In his early stage of life he connected to art, started drawing and declared that he would make his living as an artist, which was a highly unusual ambition for a young Cuban in the midst of the revolution process his country was going through at the time. Over the last fifty years, Castillo has reflected on his country’s social and political history and is often referred to as the ‘quiet chronicler’. His work constitutes a subtle critique of human conflicts, its social consequences as well as more recently, aspects of the ‘new social’ issues, like the reshaping of territories based on immigration and environmental matters, recurrent themes of Africa where he served as a medical doctor and the concern of HIV which in the case of Africa becomes an epidemic outbreak. 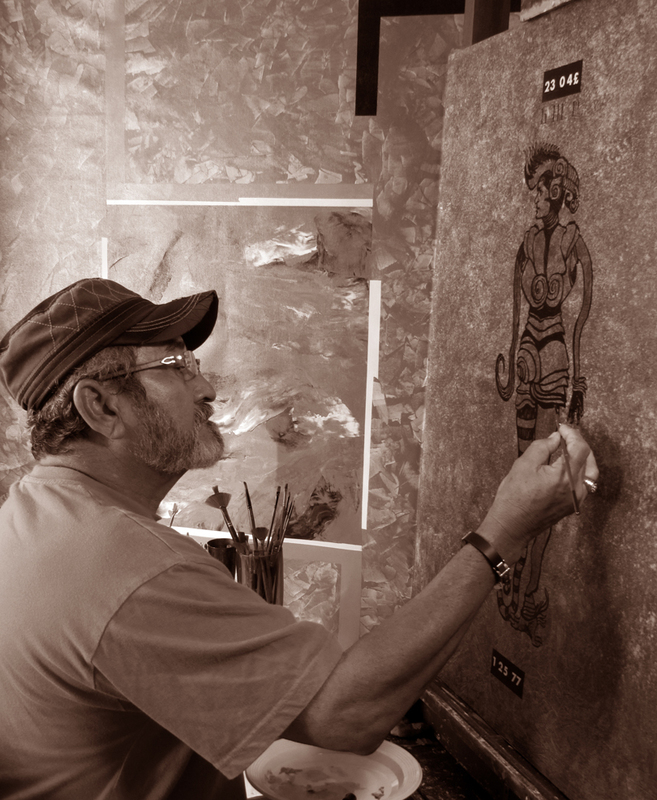 Pastor Castillo’s art is about people, and in his reflection of humanity and in the contribution he has made to the African country’s cultural development, he has become an inspiration to many other artists. Although largely self-taught, Castillo was encouraged by taking informal art classes and studying European masters that he saw reproduced in books – including Picasso, Goya and Dubuffet, and the Latin American modernist Wifredo Lam. Witty, sharp, poignant, aesthetically memorable Castillo’s work provides an extraordinary context for discussion of the cultural, social and religious syncretism between the Africa he experienced and the Caribbean that made him. Castillo’s work is very much related to the artist’s own encounters and experiences. With an education in Medicine, a training through practice in international relations and politics and his artistic experience, Castillo is very much the intellectual artist his work painting heavily on literature references and academic debate. In the tradition of many modernist and contemporary artists like Guido Llinas, Lam, Jose Bedia among others Castillo also explores the artist’s spiritual genealogy as it relates to his Cuban-based religion and its central African source. From his African series through his Metamorphosis series up to his Implosion series among many other Castillo’s life, work and contribution to art over fifty years and tells the story of an artist who is part of a lost generation, a voice that has been largely unheard in America and Europe. His silent artistic work is in the time frame to be known. He has travelled the world extensively to exhibit his work and to aid (Aids infected) children and families in Africa since1980. A true humanitarian, utilizing his artistic talent with proceeds going to those stricken victims. He is an honorable member of the Aids in Africa Foundation. His proceeds have also gone to fund the artistic education of African children. These kind humanitarian acts have won him honorable international awards. Castillo’s artworks have been shown in France, Italy, United Kingdom, Africa and the U.S.
His work is represented in corporate and private collections throughout the world. My artwork can be placed in a context that travels into various journeys, each one of them seemingly has an inconsistency or a thematic projection which is indeed variable, that is true. Conceptually and aesthetically I allow myself to be part of that game. More than a particular style or having a set of themes or techniques in my art, I diffusely articulate all of these proposals that respond to historical circumstances which nowadays are headed by eclecticism. Throughout my series, “Tribute to the Masters” “Africanist” “Nature I, II” “Adaptations” “Implosions” “Conjectures” among others, are some of the series in which I developed various lines of Abstraction, Geometric Expressionism that are inspired and motivated by a deep conversation on dynamism and in others, on a sort of statism. In my latest series entitled “Prophetic Genetics” I’m trying to ironically express the latest scientific trends in Genetic Science, a game of hypotheses about our origins which are based on experiments coming from adapting aliens and the creation of the species on planet Earth. This imagery and visual metaphors allude to possible genetic catastrophic errors as a result of unscrupulous and deliberate experiments made early from that time period. However, those objects are marked with a condition to be a sign in themselves, that is, they don’t mean anything, they have a meaning within themselves and for themselves as well. At the same time, those who observe them could transmit, receive or otherwise consider their own appreciation. To be involved in the idea and to insert myself in the current artistic process, an area in which art has exhausted its great pretensions, the challenge is not to impose something absolutely new or dramatically original. Neither is it my purpose to focus on one particular style or to be tied to an absurd struggle of exploration or experimentation. Now, I find meaning which is freer and self-determined, more spontaneous and uncomplicated, a bit loose and void of an ideology. These findings let me advance a conjecture: search originality through the non originality which is perfectly valid within the turbulence that has been subjected to the very notion of art. So I would like to conclude by quoting one of the pillars of modern thought, Dr. Sigmund Freud in his paper entitled “The Malaise of Culture” in which he says: “Unfortunately, about beauty psychoanalysis has nothing to say,” such statement could be accepted verbatim by all the contemporary art approaches.